Brad Allenby, a professor in the School of Sustainable Engineering and the Built Environment, has been inducted as an ASU President’s Professor. 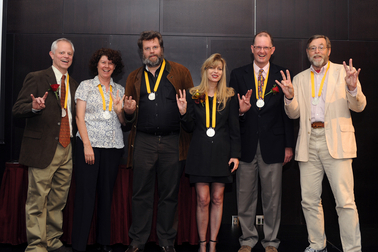 The honor recognizes outstanding contributions to undergraduate education at ASU. President’s Professor nominees are selected for their mastery of subject matter, innovation in the learning and teaching process, ability to engage students in and outside the classroom, innovation in course and curriculum design, and scholarly contributions, among other criteria. Allenby is the second Ira A. Fulton Schools of Engineering professor to be named a President’s Professor in recent years. In 2010 the honor was bestowed on professor James Adams, the chair of the undergraduate materials science and engineering program in the School for Engineering of Matter, Transport and Energy.